Viewpoint, The MidWeek Report – An important broadcast to be shared with everyone. There are two factors that will have a major impact on future elections; the first, our education system, and the second, our immigration policies, or lack thereof. These will impact the country you love friends – so we all need to get onboard in understanding the problems and then get serious in how to change the trajectory of a future that nobody should want! Subscribe to Viewpoint on Apple Podcasts by clicking here. 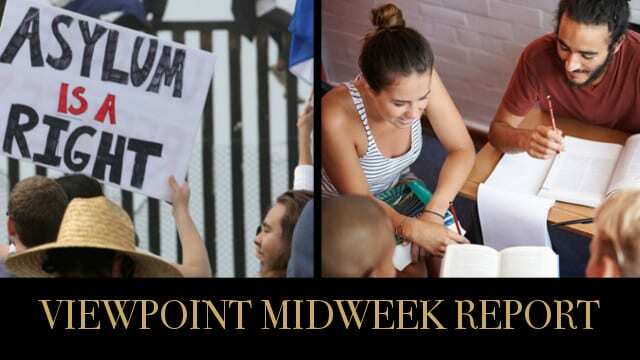 Dr Ron Martinelli and Ilana Freedman provide the analysis and in-depth discussion on the top stories we are following on the Midweek Report. Kirstjen Nielsen, Homeland Security Secretary to be fired? The focus of education has changed dramatically in the last 50 years from teaching basics of math, history, science, and English to that of a system of political and ideological indoctrination? Where does that lead us as a country? Are we producing minds that are blank but only know how to push a button and hope they get the right answer, young people who don’t have a basic understanding of the founding of this country and its importance in the scheme of world events? Where have we gone wrong and what does this mean to our future as a nation? Pastor Rick Stevens, Karen Schoen and Phil Davis, our panel of experts will explain what got us here and what needs to happen next! A changing electorate will shift the political landscape; and for many, not in a good way, unless socialism is high on your priority list. Who should have the right to vote and how do we monitor that? Citizens, legal residents, illegal immigrants, who gets to vote? Politicians line up on both sides of the issue of voter ID and then complain about abnormalities in the voting process, what is the solution? Elimination of the electoral college, some say to replace it by a popular vote, would this sway the balance of power and influence of the states in electing a president? How much influence did the media have over the outcome of the midterm elections? Del Wilber and Dr Ron Martinelli discuss the immigration crisis and the impact to all Americans.